Last week set up a final, hand-to-hand showdown between LLENN and Pitohui, and after a little friendly ribbing, LLENN manages to strike a nerve and get Pito to let her guard down. The thing is, even cutting her in the leg and throat doesn’t come close to bringing her down, and she has an iron fist waiting for LLENN’s face. She even eyes LLENN’s discarded P-chan, and has no qualms about using it to kill its master. 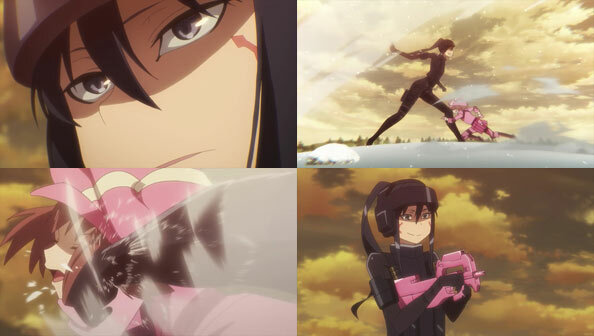 Fuka frees herself with the dagger in her hair, rushes Pito, but doesn’t attack her; instead, she cuts off LLENN’S hands and kicks her just right so she’s able to, essentially, tear out Pito’s throat. Pito admits defeat and agrees to honor the promise they made to meet IRL if LLENN killed her. Unfortunately, the very distracted LLENN and Fuka are taken out by the last remaining team (T-S) who end up winning SJ2, but LLENN’s primary objective was never to win, but to save Pito, and in that she was successful. After having tea and sweets with real-life SHINC, Karen and Miyu meet up with Goushi (of whose looks Miyu immediately approves), who has agreed to take them where real-life Pito is. On the way, he describes how he was once a pathetic fatty who stalked Pito, and ended up being captured, restrained, beaten, and turned into her manservant, all of which he’s fine with, because “M” stands for masochist. 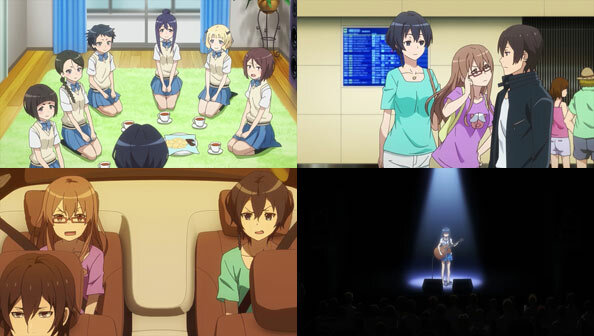 After watching Elsa Kanzaki play guitar and sing at her secret concert, Goushi takes Karen and Miyu backstage to meet the real-life Pito…the club owner. But Karen isn’t fooled; Elsa is the real Pito, because she knew things only someone who read her letter could know about her. Elsa congratulates Karen for seeing through their admittedly half-assed little ruse, and gives her a big kiss that makes her very uncomfortable (though Karen herself gave her a big hug just before that). 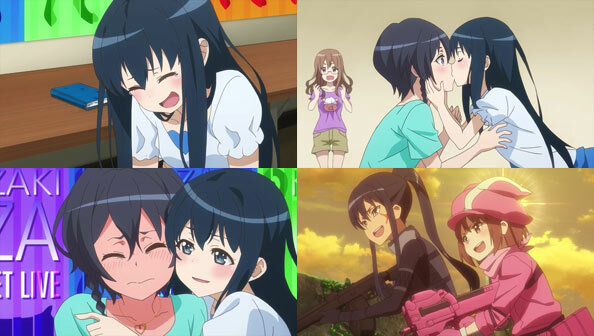 When next we see the two, they are LLENN and Pitohui, only now they’re on the same side, enjoying GGO not as a Death Game, but a place to just have fun. And after her first and only encounter with Elsa IRL, Karen is somewhat reluctant to agree to any future ones. So ends a usually entertaining, occasionally clever, but ultimately inessential edition to the SAO/GGO saga. As Hiro and most of Squad 13 and the surviving Nines head into space aboard a gigantic Klaxosaur mothership, part of a massive fleet on autopilot to Mars orbit, Michiru stays behind. Kokoro believes that because she can no longer pilot a FranXX, she has no more purpose, other than perhaps staying by Zero Two’s side as she continues to get remotely cut by the VIRM attacking Strelizia. Since she feels herself so useless, she neither expects or wants anyone burdening themselves for her sake, but Mitsuru won’t hear of it. A VIRM fleet intercepts Hiro and his Klaxosaur fleet, attempting to block them from reaching Strelizia, who they’re surrounding. 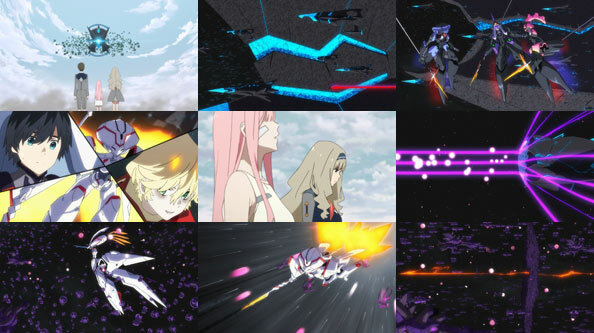 But thanks to Nine Alpha being compatible as Hiro’s pistil, and some teamwork on the part of Squad 13 and the other Nines, Hiro is able to blast through the walls of enemy ships and reach Strelizia, which is believed inert due to not having a Stamen. Alpha gets Hiro to the access hatch, but self-destructs soon after to take out a particularly large, nasty VIRM. The other Nines sacrifice themselves in similar fashion, going out doing what they were always created and designed to do: to fight in battles like this. Humans like Squad 13 have other battles to fight, whether it’s the fight in which Kokoro and Mitsuru have to start over after losing their memories, protecting one another and awaiting the new life they created, or Hiro keeping his promise to Zero Two. When he makes contact with her in Strelizia’s cockpit, Zero Two tells him she left Earth so that Hiro could remain a human, and help rebuild civilization with his Squad 13 family. But that’s not what Hiro wants. He wants to be with Zero Two, like they promised they would be, even if he becomes a “monster” like her. He believes even Zero Two wanted this despite her actions, because she left the last page of her story blank. By returning to her side Hiro is filling that blank page with a new ending, one in which the lovers never part. 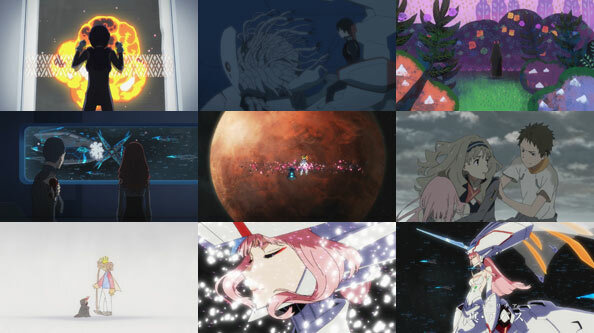 Their reunion triggers a major transformation in Strelizia Apath (or Apus, as it’s spelled in the subs this week), its mask shattering to reveal an enormous Zero Two, replacing or transporting her human body on earth into the cockpit with Hiro. 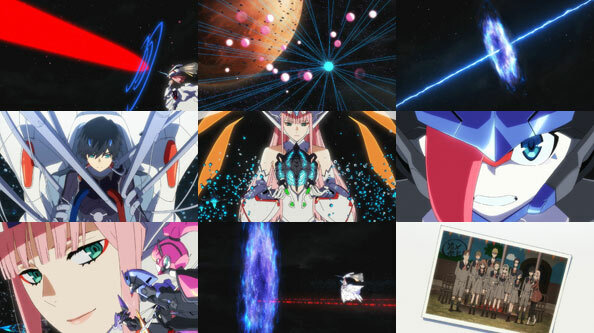 Now fully awake and in her true form, Strelizia unleashes a new and devastating arsenal of weaponry that annihilates the VIRM fleet in moments, likely ending Squad 13’s last military battle and freeing them to begin the next battle: surviving and rebuilding. However, Hiro and Zero Two won’t be joining them, at least, not for a while. Devices emerge from the Martian moons of Phobos and Deimos, and their combined beams open a warp gate to systems heretofore long out of mankind’s reach (though at this point the couple can probably no longer be called 100% human, what with the horns and all). The VIRM’s fleet at Mars is destroyed, but their main fleet is still out there, and their mission to enslave humanity and the Klaxosaurs remains in force. Rather than wait for them to threaten the solar system again, Hiro and Zero Two will take the battle to them. That means saying goodbye to Futoshi, Ikuno, Zorome, Miku, Goro, and Ichigo, as well as Kokoro and Michiru. It would be nice if they could all fight their individual battles in the same place, but it’s not to be, so they’ll all have to just wait and see if Hiro and Zero Two will ever return to them.